One of the most overlooked areas of cleaning in the home is undeniably the window draperies and blinds. Layers of thick dust and dirt on the window treatments are never a good idea and can lead to respiratory and breathing issues for those with allergies. Window blinds are easier to clean than most people realize and draperies can be cleaned in the washing machine or taken to the dry cleaners for freshening up as well. If you dust your blinds and vacuum draperies once a week, it will help keep them clean and fresh and cuts down on dust and allergens in the household as well. The things needed to clean window blinds and draperies include a feather duster, hand held vacuum or an attachment which fits on a standard vacuum can work as well, all purpose cleaner, laundry soap, paper towels, a sponge and wood oil. Taking a feather duster across the slats of your window blinds will help remove loose dust and debris, and using a hand held vacuum will remove the deeper dirt. Once the blinds have had most of the heavier residue removed, fill up your bathtub with cool water and add a capful of mild laundry soap. Place the draperies in the bathtub and wash by hand gently if the material is washable, if not a trip to the dry cleaners may be in order. Once you have cleaned the draperies, rinse completely with cool water and hang up to dry or put them in the dryer on delicate or air setting if needed. For dirty window blinds you can either take them outside and spray them down with a garden hose, or spray with an all-purpose or wood cleaner, and wipe down with a cloth. Another option is to put the blinds in the bathtub and clean the slats using a sponge; if the blinds are plastic this is ideal. If the blinds are wooden, use a wood cleaner and rub down with soft cloth, rinse with clean water if needed and then wipe down with wood oil for an extra clean smell. If blinds are made of fabric, it can be a challenge to clean them, but it is not impossible. Most manufacturers recommend cleaning these types of blinds with a vacuum upholstery attachment or brush attachment to remove loose dust and debris. 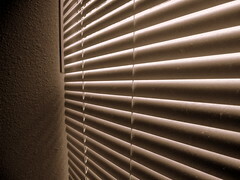 Rotate the blinds in order to make sure all the dirt and dust on both sides is removed. If there are stains or spots on the cloth blinds, you can take a dampened cloth to blot out any areas and a good mixture to use is ½ tsp. of mild laundry soap on a damp cloth. Caring for and maintaining your window treatments are not as hard as people might think. Using some common household tools and mild detergents and a bit of elbow grease will have your draperies and blinds clean with little to no effort. Keeping blinds and windows clean will help keep the home fresher and cut down on allergens which can lead to sneezing, coughing and difficulty breathing comfortably.